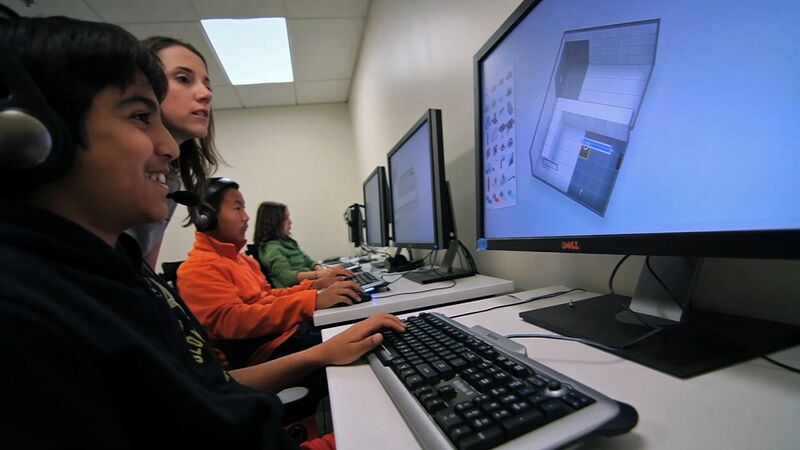 With the Portal 2 Puzzle Maker, students experience the Next Generation Science Standards by designing a video game. As an educator, I have always focused on incorporating play into my practice. When presented with an opportunity to open ChicagoQuest, a school that values play as a key component of learning, I jumped at the opportunity. As an avid gamer, I found Portal 2 to be easily one of the most complex, challenging, and funny games in recent memory. When I played the game with middle school students in my after-school video game club, I was inspired by the way they interacted and engaged in thoughtful conversation around problem solving within the game. I immediately began to think, "How can I include this game in my math and science curriculum?" I wanted my students to be able to experience each of the NGSS Science and Engineering practices (PDF, 630KB) in a game-based learning environment. Make sense of their findings. Instead of doing a science fair with a potato battery powering a light bulb (a project that gets reimagined in Portal 2 as punishment for the AI character GLaDOS), I thrust the students into the role of game designers, where they took control of implementing all aspects of an experiment from start to finish. Some students tracked how many portals their test subject used. Others looked at how long it took to complete the levels. They developed a testable question related to the game, designed a test chamber to gather and analyze data, and communicated their findings to their peers. Students were asked to quantify their findings, so their question had to be easily measured. They compared these factors with other variables such as age, gender, and past experience playing the game. Portal 2 does a great job of teaching the game mechanics as you progress through the game. In order for students to understand how the Puzzle Maker works, they need to have some experience playing through the single-person campaign. Through gameplay, the students are able to see the logic and flow of the game, and how the components of the test chamber relate to and build upon one another. Want to see some genuine excitement? I saw these kids display more joy and pride after passing a level than I ever did when they tried to see if Train A arrived before Train B if they both left Kansas City an hour apart. What are some other ways this room could be solved? What do you predict is going to happen next in the story? What clues from the narrative support your prediction? If you could change something about the test chamber, what would you change and why? What rich discussions! As part of the reflection at the end of class, we would play through a level together and open it up for discussion. Students talked about the multiple ways they solved each level, the Easter eggs they discovered, the different parts of the story's narrative, and how they solved technical issues that came up along the way. The Puzzle Maker tool is the perfect platform for students to experiment and playtest on the fly. It provides a safe place to give and receive feedback. If there was a flaw in the level design, students were able to immediately implement that feedback in a new design. As designers, this tool gave the students an opportunity to build an experience and see results in real time. I embedded multiple points where they could get feedback on their level design along the way. I first modeled the process by playing each student's level and giving them warm and cool feedback around their level design and test question. Then, later in the process, students picked a playtest partner who went through the same process with them to make further iterations. Finally, after collecting data on their final design, the students were given feedback on gameplay by their test subjects. This information was included in their final report as suggestions for further ways to iterate and improve the user experience. For anyone considering using Portal 2 in the classroom, there are some great resources and lesson plans available on the Teach with Portals website. Lisa Castaneda's Forget Aperture, This is My Test Chamber -- Data and Statistics Final Project is a great example of how teachers can use this powerful game-based learning tool to engage students in the actual doing of math and science. Minstrell, J., and Kraus, P. (2005). "Guided inquiry in the science classroom." In J. Bransford and S. Donovan (Eds. ), How Students Learn: History, Mathematics, and Science in the Classroom. Washington DC: The National Academies Press. William, D. (2007). "Content then process: Teacher learning communities in the service of formative assessment." In D.B. Reeves (Ed. ), Ahead of the Curve: The Power of Assessment to Transform Teaching and Learning (pp. 183-204). Bloomington, Indiana: Solution Tree.